After a refreshing post-swim shower, I sit in the cool of our lounge room where the sounds of Viking wars on television project from the sub woofer and pierce the walls of my brain unsettling the calm from the earlier events. I don’t understand war. Nor do I understand how a life can be lived through television. For many years I’ve wanted to go to a small seaside village on the south eastern coast of Australia just over the border into the state of Victoria from New South Wales. Mallacoota was featured on television last week. The program showcased the place, the people and the things that make it a quiet and beautiful seaside town to visit. By being out today, I suddenly sensed the pull to visit the place dissipate. It’s as if seeing it on television stole some of the mystery and desire to visit. Yes, there are many things television can do but it often leaves me feeling that I am living my life through it. And that’s not living. I wouldn’t ordinarily watch a lot of television but it’s part of the fabric of this household, of my husbands life. In the evenings the television goes on. It is engrained. Not one night has gone by in more than twelve years where television has not featured as part of the evening ritual. Despite admitting there are some benefits to it, I have learned to live with it but very reluctantly. It was incredibly hot today and tomorrow will be even hotter. This evening I had to ventured out to remove myself from a lazy day inside the house – trying to stay cool – and the thought of another night of noise and the pointlessness of watching programs like the news. 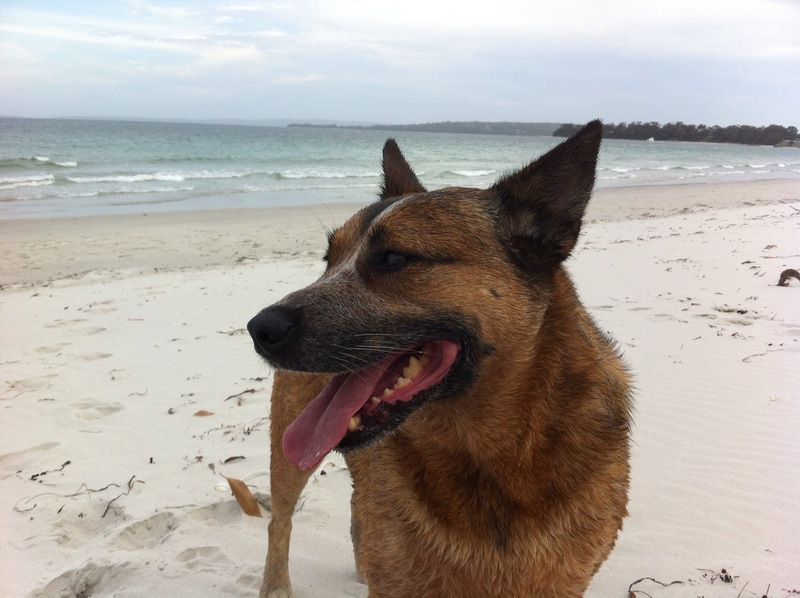 I jumped in the ute – dog in tow – and went swimming at lovely Myola beach. Myola sits in a bay bigger than Sydney harbour and the sand and waves make it great for an easy walk or swim. As I drove towards the beach, I realised there was a whole life I was missing out on by not getting out to places like this more often. The summer weather bought with it holiday makers that swell the small town to a blistering triple its usual size. There were cottage homes with their front lawns filled with cars like a car park. Every second home was alive with young people, older couples or children hovering in and around the mostly fibro-clad accommodation. I approached the jetty and couples walked by wearing flip flops and shorts exposing bronzed legs and hairy knee caps. Myola was alive! After my swim I treated myself to a honeycomb magnum, shared willingly with Louie dog. The ice cream was a bit of a disappointment. It was soon time to make my way home before the sun set. I drove almost unwillingly back towards home blaring the Zack Brown Band. I found satisfaction in reflecting on my brief but familiar outing and sang at the top of my voice together with Zach .. “I want to live like tomorrow never comes”. Short adventures like this tickle the memories of my childhood days spent frolicking by the sea in a small lazy tourist-filled town. But my mind turns quickly to the present day and I’m back in the television-filled lounge room again writing about my woes and wishes while Vikings brutally ravage English Christian forces who seek to defend their land.